Having to iron clothes is bad enough, but wasting valuable space with an obnoxious full-sized ironing board is even worse. The solution is this cool new Rev-A-Shelf Pull Out Ironing Board. 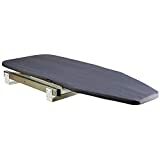 This ingenious ironing board stows away inside a vanity drawer until needed and then pulls out and unfolds with ease when it's time to do some serious ironing. The only downside is that you now need an extra drawer, but it's still a very clever and convenient space-saving solution.